Enter the following codes during play. LAPMYLOVEPUMP whenever u want in the game. Backup the file before editing it. the time settings for the game levels up to 900 secs. cheat codes, so this is a good way around that problem. type this Code when your are racing. and press the button f4. wind up on the receiving end of an opponent's vicious attack. If you're not quick enough you could end up getting wasted. straggler is standing. Then honk your horn continuously. He'll eventually panic and fall to his death. fill, you can waste the final opponent to end the level. hit enter any other time). 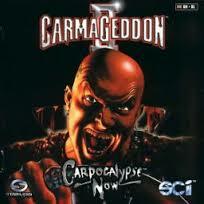 (... is the directory into which you installed Carmageddon 2). credits you win for killing pedestrians. followed by "// Time score per ped (each level)". reads, "// Starting money for each skill level"
defaults:' ) to another filename describing a car. The names of the cars you can use are found in the data/cars dir. If you try this with the truck (using VOLVO.TXT) the game might crash. kill all four controllers with ease, level finished in under a minute. fine" will appear, and you will skip the countdown.